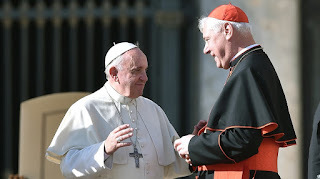 Cardinal Müller comes out strongly for "Amoris laetitia"
Cardinal Müller defends "Amoris laetitia"
Only recently Cardinal Walter Brandmüller defended the "Dubia". Now, Cardinal Cardinal Gerhard Ludwig Müller speaks out and supports the Papal letter, "Amoris laetitia". Cardinal Gerhard Ludwig Müller has defended the Papal letter, "Amoris laetitia" from criticism. Under certain conditions the reception of the Sacraments of Penance and Communion is possible, writes Müller in the preface for a book by the former Italian European minister, Rocco Buttiglione (Cathcon: he who thought female Cardinals were a good idea!. It needs discernment "beyond a slight adjustment to the relativistic spirit and a cold application of dogmatic rules and canonical provisions," said the former Prefect of the Congregation for the Doctrine of the Faith. Buttiglione as well as Müller turn against conservative critics of the Pope, who accuse Francis of error in his letter, " Amoris laetitia " (2016) on marriage and family issues in their "fraternal correction" of heresies published in September. The volume "Well-intentioned answers to critics of 'Amoris laetitia'" appears in Italy on 10 November. It may also happen, according to Müller, that the invalidity of the former marriage cannot be proved by the church. Nevertheless, it is possible that the "tension between the public / objective status of the "second " marriage and the subjective guilt" opens a way to receive the Sacraments. This leads to the "pastoral distinction" in the non-public space. God is particularly close to the man who is "on the road to repentance" and who "assumes responsibility for the children of a woman who is not his legitimate wife and who nevertheless does not fail to provide for her" , This also applies to someone who does not "make it through weakness and not out of stubborn resistance to grace" to "comply with all requirements of the moral law". A "sinful action" would not be legitimate or even culpable. But their imputability as guilt can be diminished if the sinner appeals with humble heart to the mercy of God and asks, 'Lord, be merciful to me sinner,' "the Cardinal said. However, a graduated application of the church law to a "concrete person in their existential living conditions" is not easy to implement in practice, emphasizes the cardinal. This is often not properly grasped in the consideration of the Papal letter, "Amoris laetitia". Also, Müller opposes that a stubborn sinner "wants to assert rights before God he does not have".